In our work in Serbia, working both in development and humanitarian contexts, we have recognized the need to transform or modify the prevailing concepts, theories and approaches in order to be able to respond to the increasingly complex and challenging world of education. Many of the usual ways of thinking and working proved to be inadequate for people on the move. New divides and inequalities emerge, leaving children struggling to learn and attain their rights to survival, protection, development and participation. This year’s Comparative International Education Society (CIES) conference, that took place on March 24-29 in Mexico City, adopted the theme “Re-mapping Global Education”. This renowned forum called for a renewed discussion of the future of global education by looking into divisions between the developed and developing nations – global North and global South; and looked at how migration is changing societies and schools all over the world. Calling for re-mapping of global education by involving knowledge producers that have traditionally been marginalized and disrupting hierarchies of knowledge production and distribution, the conference has called for approaches with a focus on participation, and openness to the dialogue. By including a discussion on migration, CIES 2018 has recognized the need for education systems to adapt and respond adequately to the needs of population on the move. When invited to present our project at the Promising Practices in Refugee Education: Learning from Innovations in Refugee Education panel, we looked forward to this great opportunity to showcase what we have learned and to learn from experiences from all around the world. 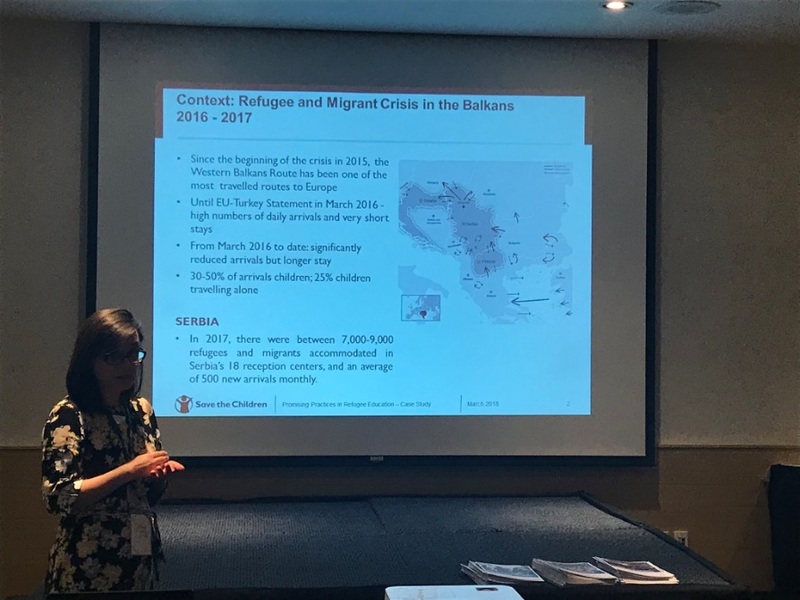 We felt that our project, already recognized as a Promising Practice in Refugee Education by the consortium of Save the Children, UNHCR and Pearson, was a good fit with the thematic framework of the conference and that we could contribute to the discussion. We worked in the context of one of the migration crises that significantly challenged European countries and added to the turbulence inside the European Union. In late summer of 2015, Save the Children responded to a massive surge of refugees and migrants, many from war ravaged Syria, travelling through south-eastern European peninsula, the Balkans, and hoping to reach safety in Western European countries. Refugee response programs were established in Serbia, Greece, fYRoM and Croatia. Until the Western Balkans route was officially closed in March 2016, over one million refugees and migrants have passed through Serbia. Even with the reduced numbers after March 2016, over 20,000 children (more than 35% of those arriving) from Afghanistan, Iraq or Syria have transited through the Balkans. This figure included large number of vulnerable unaccompanied and separated children who represented an average of 25% of children in transit. Closed borders and limited legal options increased risks and vulnerabilities refugees and migrants faced while using dangerous smuggling networks to travel. Our beneficiaries have been children in transit, exposed to conflicts and poverty in the past, experiencing traumatic events in the present and facing a future full of uncertainty, all of which affected their wellbeing and ability to learn. They have been out-of-school for close to one year and some for as long as five years. We had cases of children who have never been to school. It was challenging to comprehensively respond to their needs while they were moving across many locations and the time available for an intervention was unknown. We recognised the need to be flexible and innovative. Led by the idea that childhood and learning should not be left behind and postponed until the destination country is reached, we invested in programme improvement to help children reclaim their childhood and exercise their right to learn. In order to meaningfully respond to their needs, we needed to be open to hear what their needs are and include children in the creation of our program. By developing highly participatory methodology, we helped children explore programme options jointly with facilitators. We were interested in what is important, what kind of support would they benefit from, and how to engage them in creating empowering experiences that can promote learning. What has emerged as a result is the innovative toolkit Boxes of Wonder that facilitates implementation of psychosocial support and educational activities, which, when blended, proved to successfully reinforce each other. Rather than providing final solutions, the Boxes of Wonder offer ideas – topics relevant for children and their experience. Together with children, facilitators are re-designing the activities, adjusting them to the number of participants, needs and the actual physical space where the activities are being held. The Boxes of Wonder toolkit is in continual process of development and transformation, reflecting voices and needs of children beneficiaries. In the world of increasingly closing borders we aimed to offer children and programme facilitators an open-end resource which embraces two-way communication and the participation of equals. Lately, children refugees and migrants have been staying longer in Serbia, which resulted in their enrolment into the official Serbian education system and new adjustments in our programme. With new students, the Serbian education system is being re-mapped. The country has been affected by migration for decades, but never before has the system faced the need to include so many children coming from various cultures, with different educational backgrounds and without any local language familiarity. We cooperate with government and other partners to support the inclusion of children into local schools. Our goal is to create a system that recognizes the needs of refugee and migrant children, their strengths and vulnerabilities, and successfully responds to them. The flexibility of the Boxes of Wonder allowed them to stay relevant in our Child Friendly Spaces to support children with after-school activities, homework, or to structure programme activities with newly arrived refugee and migrant children who haven’t been enrolled into schools yet. Lessons learned in the process of creation of Boxes of Wonder have been very valuable to us in responding to the new challenges, and the Boxes continue to be an important tool for listening to children’s voices. I was very happy to be able to participate at CIES and meet many education professionals we could learn from. I am looking forward to sharing more detailed information and apply some of the innovative approaches to better our programmes in Serbia.